Do you want to be humble? If we’re being honest, many of us would say “No” to that question. Others of us might pay it lip service, but deep down feel uncomfortable with the idea. Humility seems to be so in conflict with all the things that our modern society holds dear. How could anyone living in our modern world actually strive for humility? The answer is that if we are seeking holiness, humility is a big part of that equation. As someone who confesses to pride every single time I go to confession, humility is something I clearly need. 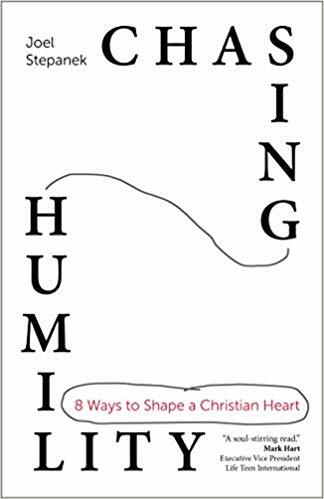 This is why I eagerly starting reading Chasing Humility: 8 Ways to Shape a Christian Heart by Joel Stepanek as soon as it arrived in my mailbox. Lord Jesus. Meek and humble of heart, Hear me. Simply reading through, one realizes just how difficult it is to pray this prayer and mean it. Stepanek acknowledges that it took him quite a while to come to terms with understanding and desiring humility. He had a false view of humility, thinking that “you were either successful in the eyes of the world or you were humble and destitute but you got to be a disciple of Jesus.” In time, he came to realize that G.K. Chesterton’s definition is much more accurate: “Humility is not thinking less of yourself, but thinking of yourself less.” In fact, the only way to be truly successful is to embrace humility. Stepanek divides the petitions in the Litany of Humility into eight main themes: being authentic, growing confidence, being grateful for today, loving others, giving praise, empowering those around me, becoming the mentor, and breaking boundaries. He explores each of these themes, offering concrete ways to work on each area. He also shares anecdotes from his own life to illustrate that he is right there with us, struggling to develop humility. Like most things on our spiritual journey, cultivating humility is a life-long process. As an interesting side note, the author of the Litany of Humility is unknown. His prayer for humility was answered. God will answer our prayers for humility as well, if only we are brave enough to trust in God and pray for it. Chasing Humility offers so much food for thought. This is a hard topic and one many will reject without a passing glance, but if you are serious about becoming closer to God, this is one book you will want to pick up.